Slow and very hot burning Premium wood fuel, oak logs has a massive heat output that is better than, ash, and especially birch. If you want a good heart to a fire then oak will provide this, the smell of oak burning in homes brings winter warmth and homely smells. Our Premium Oak Logs are normally chunkier therefore they last longer. One of the best logs for burning, why because of the high heat out put. We only supply premium kiln dried oak logs as a wood fuel. Each massive 2m3 pallet/crate of OAK LOGS is stacked by hand, the log length is approximately 10inches (250mm) with a moisture content below 20%. Typically 8-13% externally and 10-15% internally. 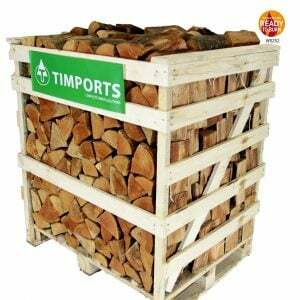 The pallet/crate is approx: H:207 W:116 D:85 and acts as a secure, stable log store. We believe our customers receive more logs for their money compared to “large crates” sold by some of our competitors and dumpy bags of logs which are thrown in. Is hot and slow burning and efficient, perfect for wood burning stoves, pizza ovens, open fires, BBQ fire pits great for the summer. FREE Nationwide Delivery (Highlands surcharge applicable). Wholesale prices are available for large orders on request. Please contact us for more information* Please check dimensions before buying. The crate is HUGE. We chose to buy our crate of logs this year from Ollie at Timports and haven’t been disappointed! We had a few hiccups with the delivery (which Ollie managed to sort – it wasn’t Timports fault) but then all was well! We’ve also swapped the type of wood this year and are loving the oak…it burns a bit slower and hotter and smells lovely. We’re happy with our purchase. The large crate held more logs than 3 dumpy bags from my local supplier costing around the same for inferior wood. These logs are long burning and controllable, meaning I only burn half the quantity I did Previously. A good layer of bone dry Ash kindling gets the Oak going and up to temperature quickly. Excellent product. Delivery on time. Wondered if these logs were too expensive, as they are twice the price I usually pay for local softwood logs. However, the crate of oak logs has lasted almost three times as long as my old supplier’s logs, and the heat generated is awesome. Now a convert to Timports, doubtful that I will ever buy elsewhere again.